**** Chosen by Winner: Paul B. NOTE: Restrictions on delivery of automatic knives in accordance with federal and state laws apply. Click for complete rules. This Godson Ultimate Custom automatic knife from Pro-Tech is a stunning piece that has been beautifully customized. The handle is hand satin finished 6alv4 Titanium that has been beautifully hand engraved by FEGA Master Engraver Bruce Shaw. 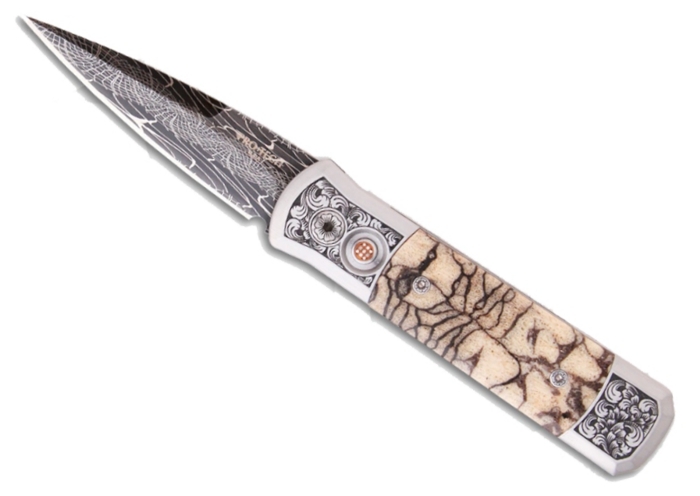 The inlays are presentation grade Tiger Coral with a mosaic pin push button. The blade is visually spectacular Chad Nichols Boomerang Pattern Stainless Damascus. This Godson Ultimate Custom includes a wood presentation box that is custom laser engraved with all the details about the knife. Pro-Tech Knives, LLC is a family owned knife company that has been building high quality American Made knives for nearly 20 years. Pro-Tech KnivesOur production knife models offer the best design, function, and value of any knife on the market today. Our custom art knives are unique pieces of art. Each of our custom, limited-edition knives is a showpiece of heirloom quality. No matter which of our knives you choose, we are confident that you will be very satisfied with your purchase.